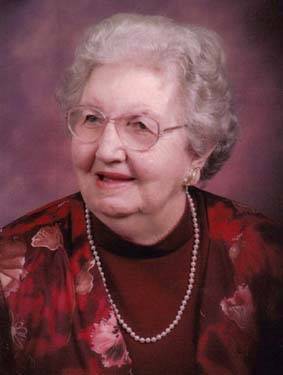 Bessie Mae Alford Lewis, age 103, of 4200 Old Lewis Farm Road, died Friday, January 23, 2009. Mrs. Lewis was a retired school teacher, a farmer’s wife and homemaker. Funeral service, 3:00 p.m. Monday, January 26, 2009 at Knightdale Baptist Church. Burial, New Knightdale Baptist Church Cemetery, Mailman Road, Knightdale. Surviving are her children, Frances Cooke, William and Mary Frances Lewis [AAFA #1179], Doris and Dwight Poole, Curtis and Sue Lewis, Stanley and Marilyn Lewis, all of Raleigh, Janet and Henry Hardee of Shallotte, Evelyn Godley of Roanoke, VA, Robert Lewis of Goldston [AAFA #0789], Faye and Julian Hurst, and Lyn Troxler, all of Cary; 100 grandchildren; great-grandchildren; and great-great-grandchildren [see note below]. Mrs. Lewis was predeceased by her parents, the Reverend John and Lucy Alford, and her husband, Vasco Earl Lewis, a granddaughter, and a great-grandson. She was the oldest and the last living of seven children. The family will receive relatives and friends from 3:00 to 6:00 p.m. on Sunday, January 25, 2009 at L. Harold Poole Funeral Service and Crematory, 944 Old Knight Road, Knightdale, NC 27545, and other times at the Lewis home. Flowers are appreciated, but at the request of Mrs. Lewis, in lieu of flowers, contributions be made to Knightdale Baptist Church, for the Lewis Mission Trust, P.O. Box 21, Knightdale, NC 27545. Condolences to the family may be made at www.poolefuneral.com under Obituaries. We included the obituaries of her sisters Gay Alford Sargent and Ruth Alford Read in North Carolina Obituaries. She was present at AAFA’s meeting in NC in 2001. 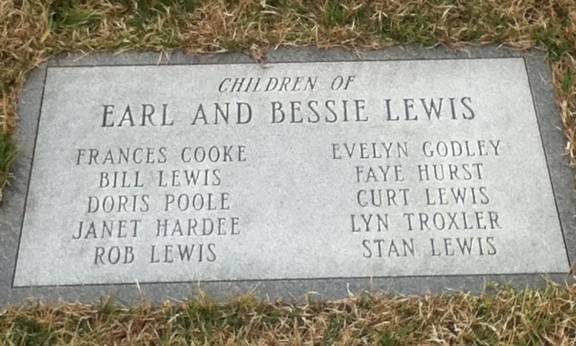 Note from Bessie’s son Rob Lewis: Bessie had 10 children, 26 grandchildren, 45 great-great-grandchildren, and 12 great-great-great-grandchildren. The “100” stated in the obituary represents all of her descendants, including step-grandchildren, etc. 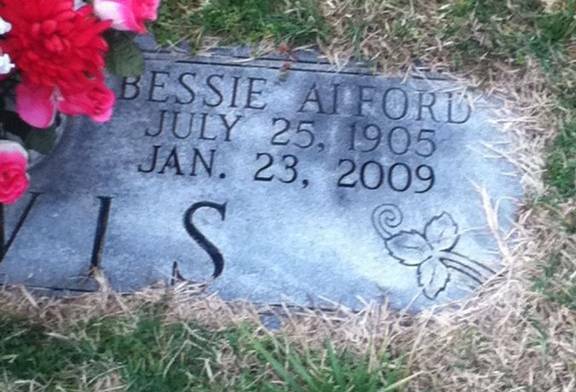 Her lineage: Bessie Mae 1905 NC1, John William 1881 NC2, Benjamin Joseph 1854 NC3, Henry Hardy 1826 NC4, Exum 1788 NC5. Vasco Earl Lewis, 92, of 4200 Old Lewis Farm Rd., died Saturday, February 22, 1992. Mr. Lewis was a retired farmer. Funeral 3 p.m. Monday, February 24, 1992, Knightdale Baptist Church. Burial, New Knightdale Baptist Church Cemetery. Surviving: wife, Bessie Alford Lewis; daughters, Frances Cooke and Doris Poole, both of Raleigh, Faye Hurst and Lynda Troxler, both of Cary, Janet Hardee of Ocean Isle and Evelyn Godley of Roanoke, VA; sons, William E. Lewis Sr., Curtis Lewis and Stanley Lewis, all of Raleigh, Robert G. Lewis of Goldston; sisters, Ollie Hinton, Gora Edwards and Jerada Collins, all of Zebulon, Vada Strickland of Nashville, Fannie Edwards of Windsor and Grace Driver of Middlesex; brothers, Elvis Lewis of Raleigh, Irvin Lewis and Basco Lewis, both of Middlesex, Carrell Lewis of Windsor, 26 grandchildren, 24 great-grandchildren. Family will receive relatives and friends 3-6 p.m. today, February 23, 1992, at L. Harold Poole Funeral Service, Knightdale; and other times at the Lewis home. In lieu of flowers, the family requests that memorial contributions be made to Knightdale Baptist Church, Lewis Mission Trust, P.O. Box 21, Knightdale, N.C. 27545.